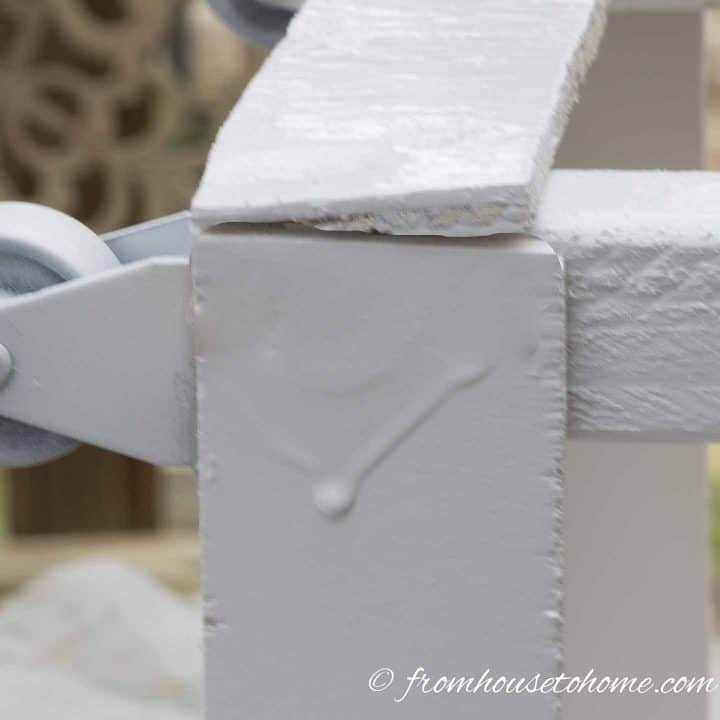 Learn how to avoid spray paint drips, cracks and bubbles with these spray painting tips and tricks that will ensure a smooth finish. Spray painting is one of my favorite ways to quickly update almost anything, from pieces of furniture (like my bar cabinet makeover) to crafts (like these mason jar candle holders). 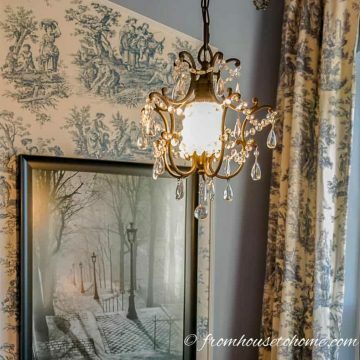 But it can be a bit tricky to get an even finish that is free from drips, cracks and bubbles, which is where these spray painting tips and tricks come in handy. I am a big fan of spray painting. Mostly because it is easier to get paint into all of the small crevices when you spray it, and it dries so quickly that your projects get finished much faster. The only problem is, I am not very good at using spray paint. I never seem to be able to get it to go on evenly. And the surfaces never seem to be as smooth as I would like them. I have learned the hard way (by experience) that there are some things to do (and some things not to do) if you want your spray painted projects to be successful. I’m sure that some spray-painting gurus will disagree with some of these. But this is what has worked for me. So I thought I would share what I have learned about how to get a smooth finish with spray paint. 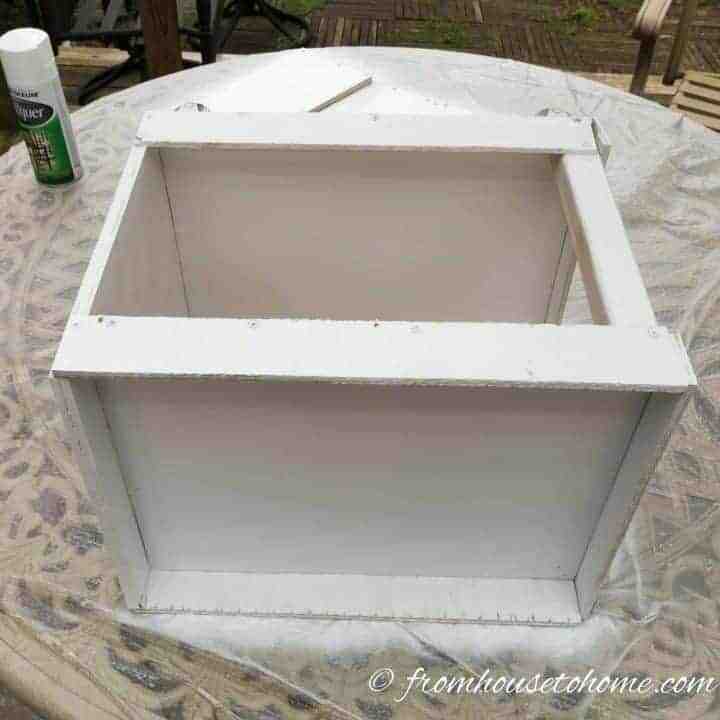 Keep reading to see my spray painting tips and tricks that will produce a smooth finish. Generally speaking, spray paint drips like this one mean that you’ve put on too much paint. However, I find it’s almost impossible to avoid them when you are spray painting vertically. It is much easier to get an even finish when you only spray paint surfaces that are facing up. That way, even if you spray a little too much, the paint seems to even itself. You may say, that’s really easy to do it you’re spray painting some boards…but what about a shelf unit like this one that is already put together? 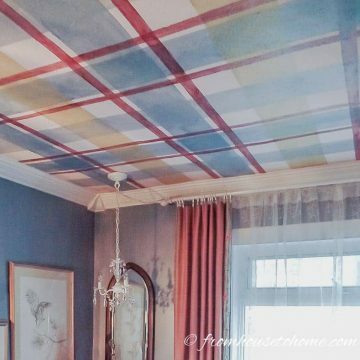 I spray all of the surfaces that are facing up, and then flip it onto the next side so that I can spray the next set of upward-facing surfaces. It takes a little longer because sometimes you have to wait for a side to dry before you can turn the item over. But I think the results are worth it. When you are flipping boards over to paint the other side, or setting the boards out for round 2 of painting, be careful where you put them down. 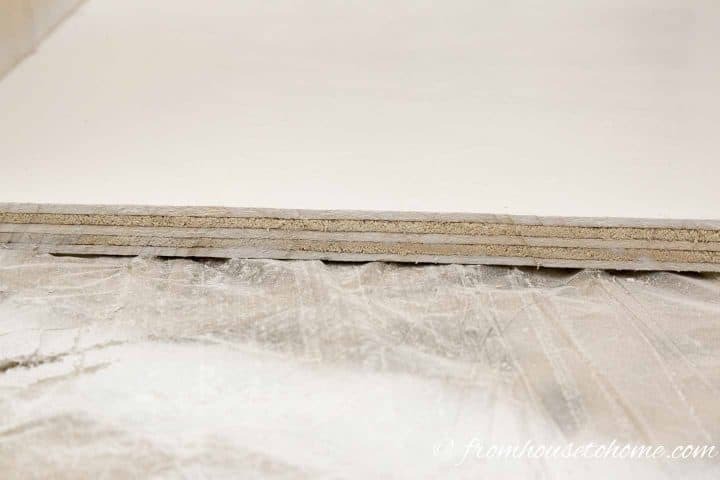 Although the paint on the board may have dried well enough for you to touch it, the paint that is sprayed all over the plastic drop sheet (or whatever you were using to protect the surface) probably hasn’t. 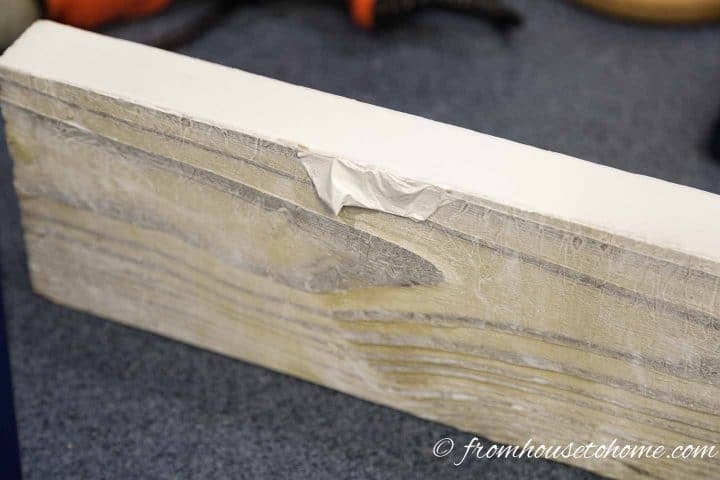 Large pieces of somewhat wet paint will peel off the protective covering and stick to your board (as you can see). And they are really hard to get off cleanly…you usually have to sand them and re-paint. I have found the best way to prevent this, is to put down a fresh piece of plastic whenever you move painted pieces off your work area. 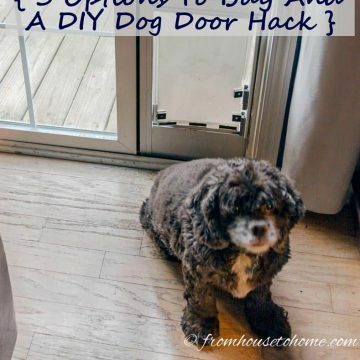 In this case, I was using an 8′ long plastic drop cloth and my table is only 3′ wide, so I could just fold the end over to cover the area…and that solved my problem! 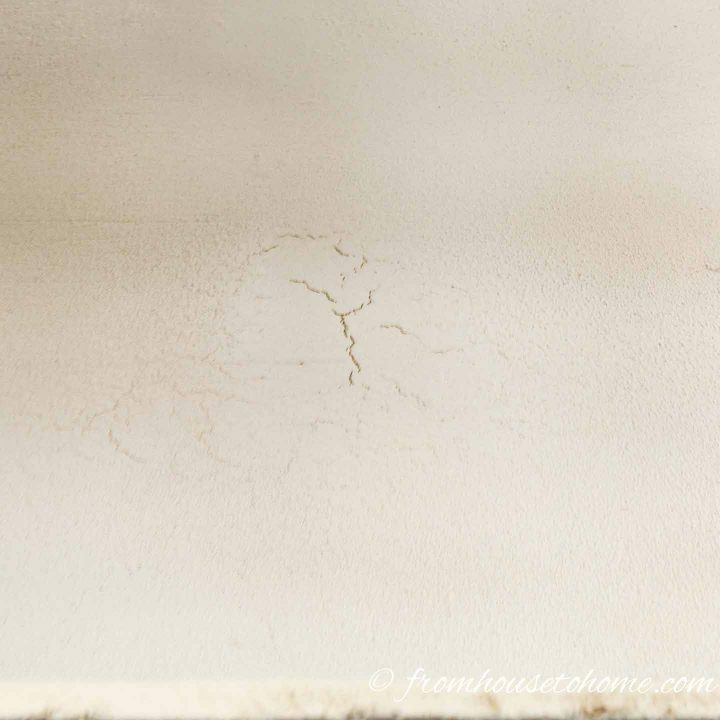 If you spray the paint on too thick, you might start seeing some cracks in the paint like this one. Take it from me…they are really hard to get rid of! So the lesson learned is to do at least 2 thin coats of paint (and 3 is even better). Since you can usually re-coat spray paint in a few minutes, doing a few passes on it doesn’t really take that much more time. I have also found that painting against the grain with the first coat and then with the grain on the second coat provides really good coverage. 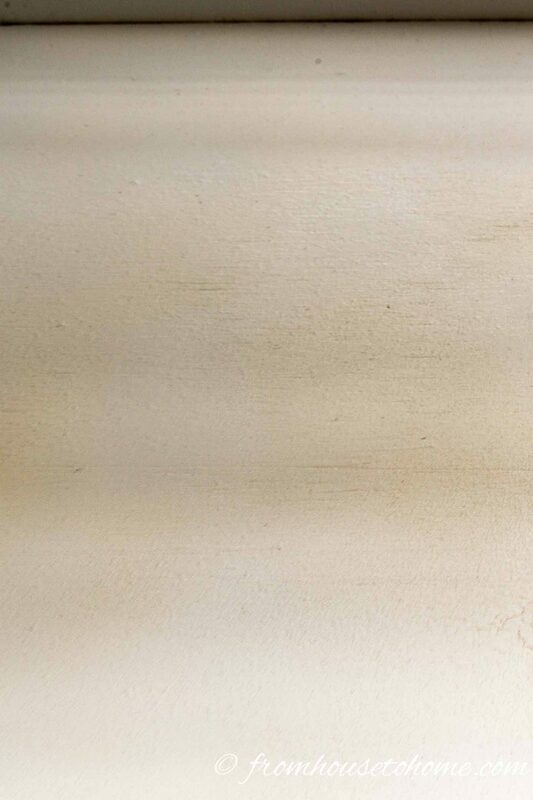 If you really want a smooth finish, do a light sanding between coats of paint to remove any little bumps. If you read the instructions on most spray paint cans, they will actually tell you not to spray paint in direct sunlight…but I have never paid that much attention, until I started getting this really rough finish in the paint. Apparently if it’s too hot, the paint dries in the air before it hits the surface and causes these little bumps. Sanding is definitely required to fix this issue! This is another one of those “follow the directions” things. 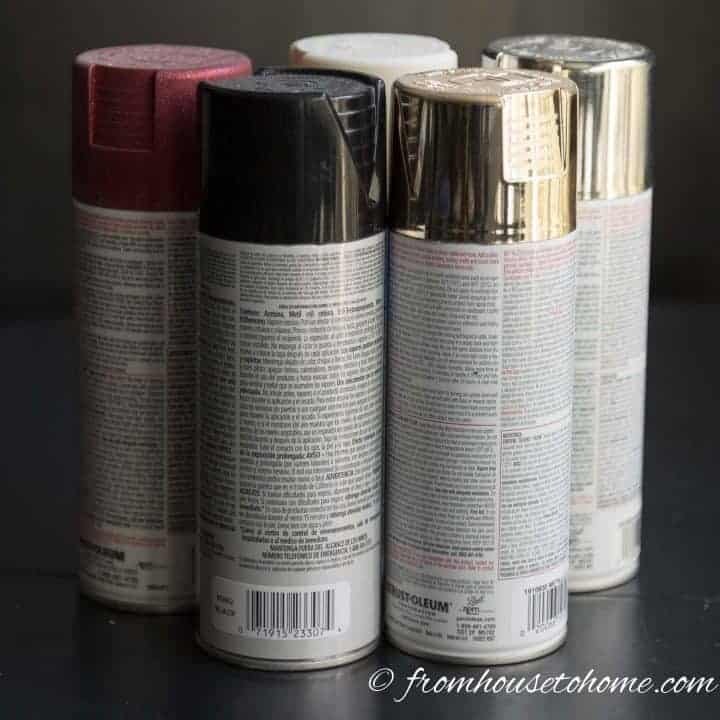 I had never really noticed that much difference between shaking the can a lot and shaking it a little…until I went to use this Antique White spray paint. All of a sudden I started to get streaks of off white (the color I was going for), mixed with streaks of light brown (definitely not the color I was going for). Shaking the can for at least a minute gets rid of the problem…and taught me that the instructions are right! If you’re going to be doing a fair amount of spray painting, spending a few dollars on a spray trigger* is definitely worth the investment. Trying to hold down that little spray paint button gets tiring really fast! 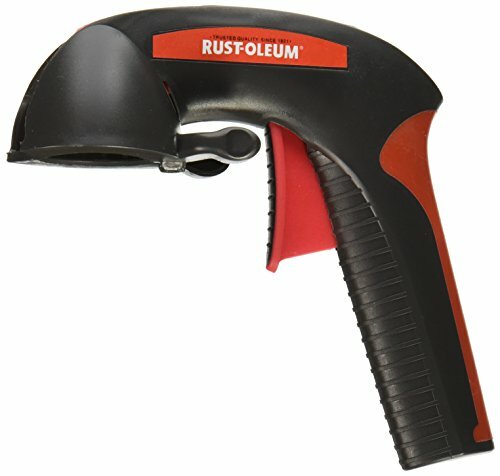 These spray triggers make the job a lot easier, and save on the finger fatigue! 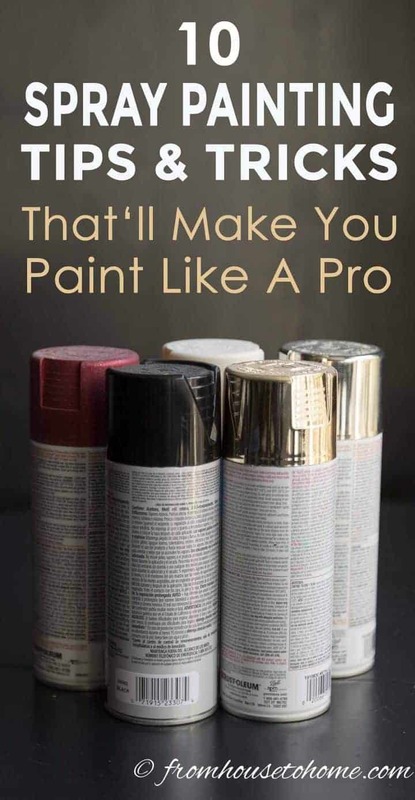 In any case, most spray paint instructions will tell you that you can re-coat within a few minutes, but if you leave it to try for more than an hour then you need to wait 24 hours. 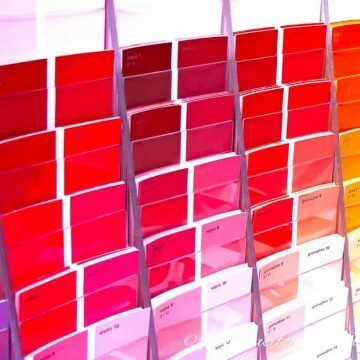 If you don’t get enough paint, you’ll have to make a run to the store, and chances are you won’t be back in time to meet that 1 hour time limit…which means waiting another day to finish the project. So always buy more cans than you think you need. You can always take them back if you don’t use them. 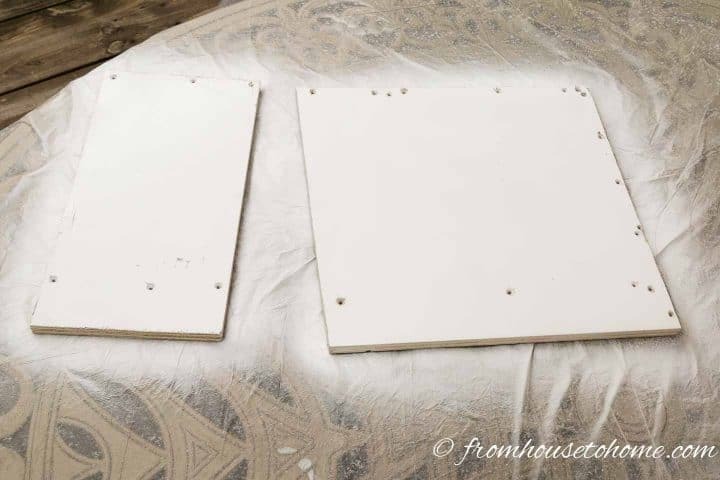 If you’re trying to paint the edges of plywood boards…don’t use spray paint. 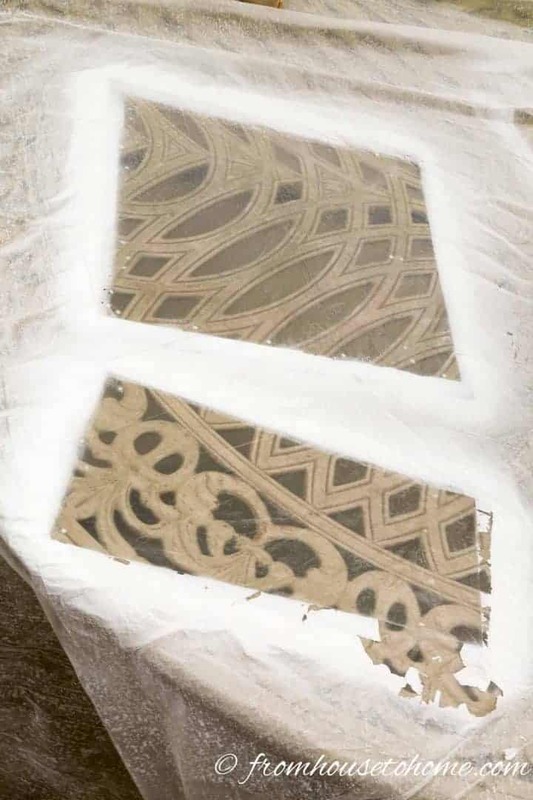 Because the layers of paint are so light, it doesn’t fill in any of the rough bits and the surface ends up looking like it wasn’t painted. It doesn’t seem to matter how much spray paint you put on it, it doesn’t get much better. And you’ll probably end up with excess paint on the surfaces around the edge. If the edge will be obvious for the project you’re doing, a brush with some regular latex paint works pretty well. When you’re about to put on the last coat of paint, it pays to open a new can. The paint spray from a new can is usually more uniform and easier to apply evenly (just make sure to shake it well). Once you get down to the bottom, the nozzle may be getting blocked, and the paint is less likely to come out evenly. 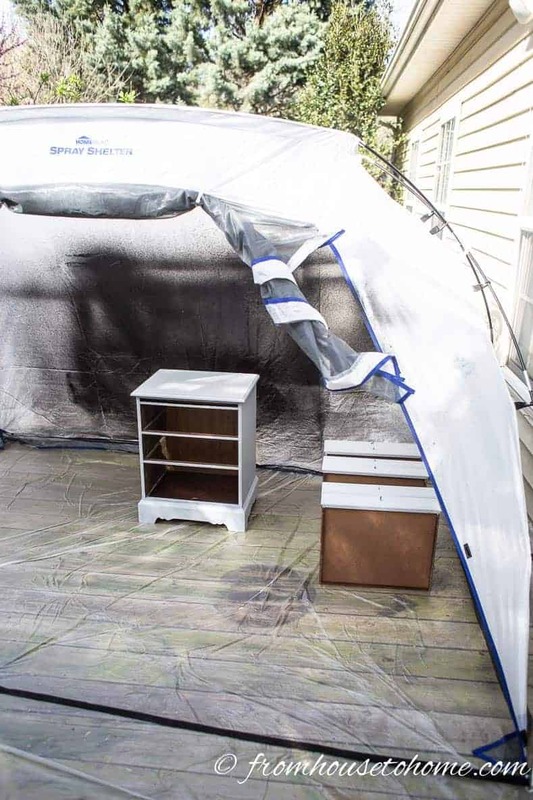 I usually try to do spray painting outside…the fumes are really strong! 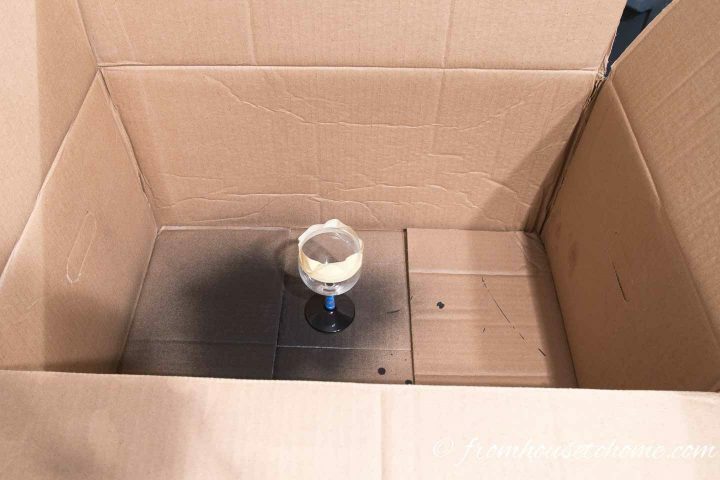 But if you do have to spray paint indoors and you don’t want paint everywhere, use a box to contain the over spray. 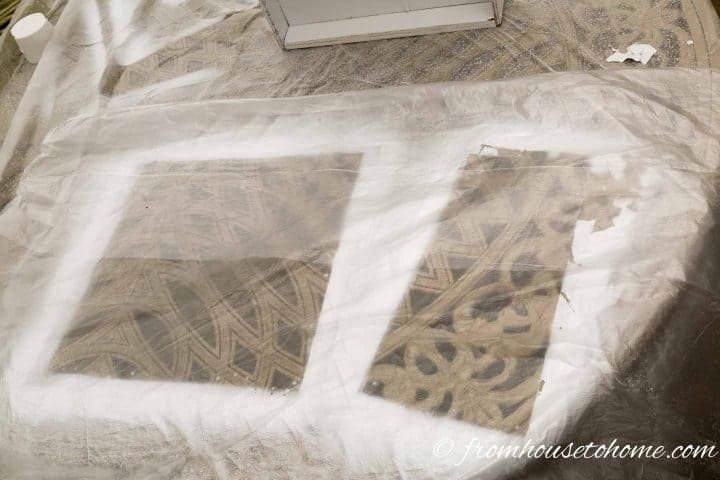 Obviously, you’ll need a box that is big enough to surround whatever you’re painting…so the larger the item, the bigger the box will need to be. If you don’t mind spending some money, you can also get a special spray shelter* that really does a good job of preventing the paint from getting everywhere. 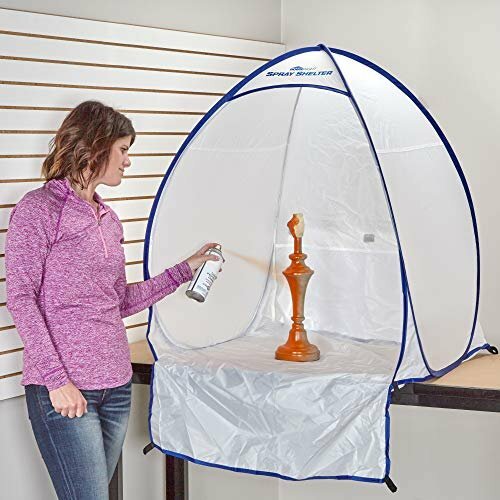 A larger paint tent* is available for when you are spray painting larger pieces. It’s especially useful when you are painting outside since it comes with a “door” that you can close when you’re done. That keeps all of the dust and bugs off of your furniture until you are finished. 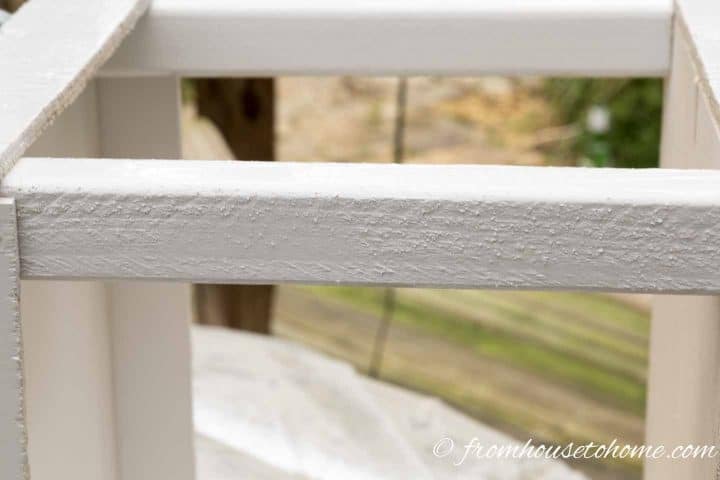 And there you have it…my spray painting tips and tricks for a smooth finish. Hopefully, some of them will work for you, too! 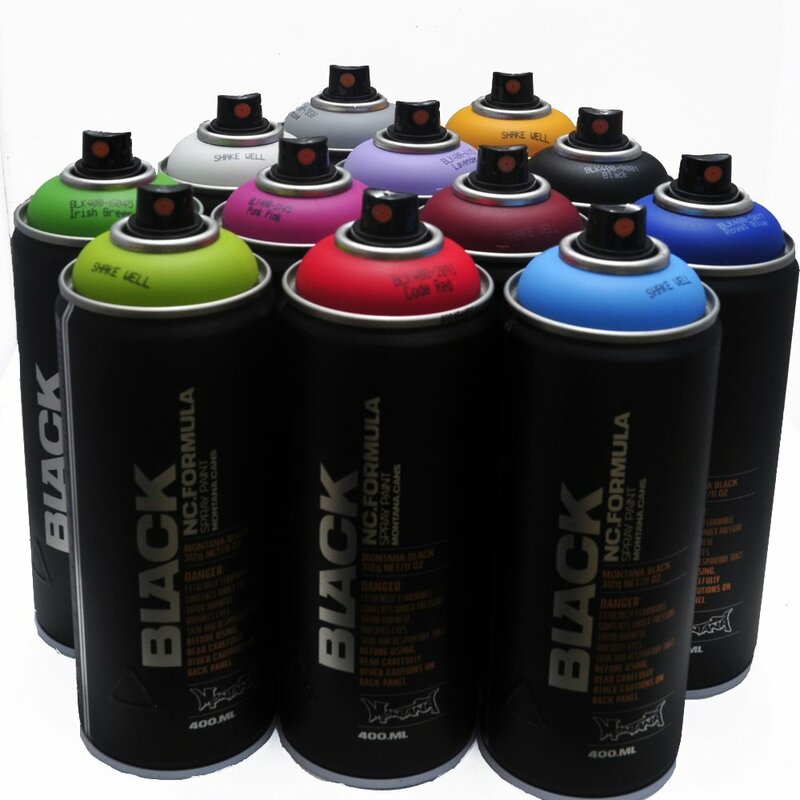 Have comments or questions on our spray painting tips and tricks? Tell us in the section below. 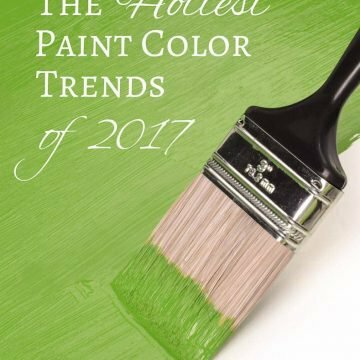 This is THE best article I have found about spray painting! Every other one I read didn’t talk about the “real” issues – wet spray paint on plastic sheet sticking to next item to spray, how tired your trigger finger gets, HOW to do it outside. You’re a good send – thank you for true, useful tips!!! All of those tips are really helpful!! It seemed as you were reading my mind, I did all of the things you wrote about so I learned the hard way. I wish I had read your post when I started to spray painting stuff. By the way, I always wondered why sometimes I got cracks on the paint and I know the reason now. Thank you for sharing with us at Sweet Inspiration party!! Pinning! Have a wonderful week! Thanks, Pili! Hopefully the spray paint tips will prevent someone else from making the same mistakes! Thanks for hosting the Sweet Inspiration link party! Hi. That was so informative. Thanks for the help. One question: I don’t understand why if you don’t do the second spray in an hour you have to wait 24 hours. Thanks!